In the realm of compact crossover SUVs, there’s tough competition. Things get especially tough when you compare SUVs from a brand that has its roots embedded in WWII military vehicles and an SUV from a Japanese juggernaut know for its stalwart vehicles. The Jeep® Compass surprises drivers with its balance—a pleasantly luxurious interior, sharp exterior styling, steady city performance, and, of course, amazing off-road capability. However, Toyota’s RAV4 does offer a challenge, with a similar engine, build, and popularity. Your friends at Southtown Chrysler have put the Compass and the RAV4 head-to-head, in a battle of compact SUV dominance. Which vehicle will be victorious? For 2019, the RAV4 is completely re-designed, bringing an extremely out-dated exterior into the realm of almost-modern with a humongous grille that takes up the majority of the front fascia while the body is subject to over-exaggerated chisels. The only saving grace is seeing the vehicle from behind with its interesting angular taillights and twin exhaust. With the Compass, you have a vehicle that feels premium, with an aerodynamic shape, smooth lines and sloping roof design. Don’t forget about Jeep’s signature 7-slot grille. With the Compass Trailhawk edition, you get dramatic styling, with signature red tow hooks and a black anti-glare hood decal. The base Compass North already edges out the base RAV4, but when you deck both of them out? The Compass blows the RAV4 out of the water. The cabin on the RAV4 is rather uninspired, focused on being spacious and straightforward. The interior looks similar to most other competitors in the compact SUV segment, aside from the touchscreen protruding out of the center of the dash. Though Toyota did finally add Apple CarPlay™ to the RAV4 after years of wait, there’s still no Android Auto available. A big strike for all those Android users out there. 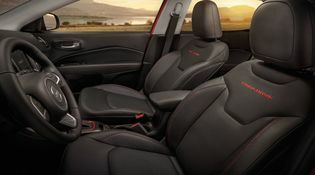 When you go with the Jeep® Compass, you go with a vehicle that is spacious and has plenty of high-quality materials woven into the interior to create a balance of comfort and ambience. A vehicle that has a 4th generation Uconnect multimedia system, an available 8.4-inch touchscreen that is embedded into the dash, and yes, both Apple CarPlay™ and Android Auto capability. 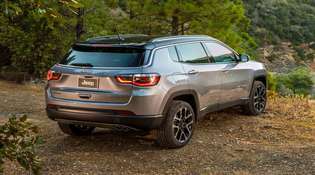 Under the hood, both vehicles are similar, with a 2.5-litre I-4 on the RAV4, and the 2.4-litre I-4 on the Jeep® Compass. The RAV4 has slightly more horsepower than the Compass (203 vs. 180). However, neither vehicle is going to wow with engine capability. The RAV4 and the Compass are designed for utility, performance-wise they’re down to the wire, with the Compass having more agile steering to combat where it loses ground in the horsepower race. 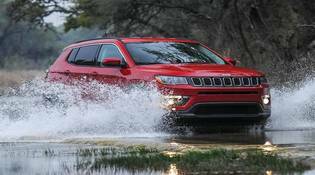 But when you consider the off-road potential the Compass has with the Trailhawk edition, the Compass easily pulls ahead as the dominant vehicle. Though the compact SUV division is extremely well represented—and the RAV4 is an admirable opponent, it’s clear who the victor is. With a powerful exterior, plenty of modern technology and commendable off-road ability, the Jeep® Compass is your top compact SUV! Luckily for you, the off-road champion Jeep® Compass is available now at Southtown Chrysler! Please contact us if you’re interested in the Compass or want to learn about any of the other amazing models we carry. Don’t forget, we also offer service from our trained technicians for all makes and models, come down to Southtown! If you have any questions about the Pacifica, don’t hesitate to contact us. We also offer service for all makes and models and have a massive parts inventory. Make Southtown Chrysler your automotive destination!